General Overview Stephanie O'Hara is a gifted Engineer and hacker. She thinks that her talents in this area entitle her to a certain acerbic attitude. She frequently thumbs her nose at authority figures, and to this point has gotten away with it because she's the best at what she does. She's easily distracted by her own side projects. She's stubborn, with an Irish temperament, and she's abrasive, but she has a good heart. She was once described as "crunchy on the outside, but soft and squishy inside". * Fierce Loyalty - This is actually a weakness as much as it is a strength. She's loyal to those she considers friends, almost to a fault. * Curiosity - Stephanie hates mysteries. She can't lay a problem to rest until all of the questions have been answered. * Honesty - While she may be flippant at times, She never lies. She considers this a point of personal honor. She will always tell the truth as she sees it, even if it's an unpleasant truth. * Talent - O'Hara is a gifted Engineer. She has a unique (some would call it almost Vulcan) understanding of Engineering principles. * Dedication - While she may not be the model officer, O'Hara is dedicated to proving that she's the best at what she does. She has a work hard/play hard mentality. Her intensity is part of what makes her a good Engineer. * Dataport: Part of what makes her so good at working with computer systems is that she had a dataport implanted at the age of 13. * Heart of Gold: In spite of her other shortcomings, at the core of her being, she really is a good person. * Overconfidence - The only thing worse than someone who's good at what they do is someone who knows they're good at what they do. It's created quite the chip on her shoulder. * Attitude - O'Hara has attitude in spades. She is flippant, acerbic, and has a real problem with people who haven't earned her trust. She believes that respect and Trust is a two way street. You have to give it to get it. As such, many find her abrasive. * Drinking - Stephanie enjoys her booze. Some say a little too much. On more than one occasion, she's been written up for showing up for her duty shift hungover. 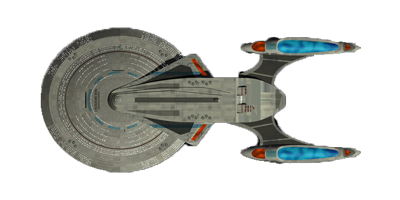 * Past - Stephanie is in Starfleet because she's using it to shield her from her past. She grew up on the streets of New Sydney, and has previously worked for the Orion Syndicate. She wanted a new life. While in the employ of the Syndicate, she was engaged in illegal activities. She left this off her application to Starfleet Academy. * OCD - In her mind, good enough never is. The job isn't done until she says it's done, until it's perfect. * Inexperience - She's spent the last 10 years on Earth, 6 of those working for Starfleet Security, developing new methods of Data Encryption. She has very little experience aboard a Starship, in the day-to-day operations of an Engineering Department. * Dark Humor - Stephanie has what some would call a twisted sense of humor. She delights in things others may find detestable. * Practical Joker - Hand in hand with her dark sense of humor, The beginning of Stephanie's "fall from grace" was her history on New Sydney. She would plant cascade viruses in the government mainframes. They were mostly harmless, but she derived endless amounts of joy from watching the chaos she caused. *Single Mindedness - O'Hara is innately curious. So much so that she will find herself absorbed in projects to the exclusion of everything else, including food and sleep. Ambitions Stephanie, Much like Montgomery Scott, never wanted to be anything else aside from an Engineer. Her passion is solving problems. Stephanie lives for the challenge. Every problem to be solved is it's own joy. She never really wanted to be anything else. Her drive and her passion is to be the best at what she does. Hobbies & Interests * Gambling - In addition to traditional human games of chance, Stephanie had a great deal of experience with Ferengi traders that visited New Sydney. She learned the finer points of Dabo, Tongo, and other games of chance. * 20th and 21st Century Earth Music - She has always loved music. She took a particular interest in this era because, as she puts it, "The music has heart". * Practical Jokes - This has always been a delight of hers. Her in this comes as much from the planning and execution as much of the aftermath. She does take great pains to make sure no one gets hurt and no permanent damage is done. * Computer Hacking - She loves probing computer systems for vulnerabilities. It's kind of like a game to her. She gets to match wits with someone who thinks they can keep her out. * Singing - Stephanie has a a lovely singing voice. Mental Health When O'Hara is sober, she tends to be very mentally sound. She is what's referred to as a "Borderline Alcoholic". She does drink in excess, and when she gets going she has difficulty stopping. If she has a task that requires her to remain sober, she will do so. She becomes belligerent and sometimes violent when people confront her about her drinking. Personal History Stephanie O'Hara had always been something of a problem child. Her curiosity, coupled with her twisted sense of humor and her flippant attitude made her quite the handful. Growing up on New Sidney, she found herself with no end of vices to occupy her time. Before long she had built her own mainframe out of scavenged and discarded parts and was hacking into government systems to play pranks on various agencies. She Before too long, she had gotten herself noticed by the Orion Syndicate. The Syndicate recognized her talent her talent as something they could exploit and had her fitted with a data port. She was 13 years old. For five years, she worked as a freelance hacker for the Syndicate. She was far enough removed from the consequences of her actions, that she never gave it a second thought. She was more interested in the challenge than the results... And the pay wasn't anything to sneeze at either. She learned a great deal. Not just about Engineering and computer hacking but about the streets of New Sydney. She learned to gamble, fight, to fly shuttles, anything anyone would teach her. Her epiphany came when she found out her father's business was in huge amounts of debt to the Syndicate and she was told she had to choose between her family and the Syndicate. Ultimately, she made the right choice and booked her parents and brother on a ship off-world with forged IDs. She knew as soon as soon as the Syndicate caught wind of what she had done her life would be over, so she went to the only organization that could protect her. She enrolled at Starfleet Academy and majored in Computer Programming with a minor in Warp Theory. Her instructors quickly noticed that she had a problem with authority. She would argue with them in class, turn in assignments when she felt like it, and generally make a big stink about how there was really nothing they could teach her. It was noted in her personnel file on more than one occasion that she was "not officer material" and she "didn't embody the ideals of the Federation". The only reason this behavior didn't get her tossed out on her ear was the fact that she really did know her stuff. and when she did hand in her assignments, they surpassed every expectation of her instructors. She would have been content to be a non-comm but was pushed into officer training by an instructor who convinced her that Engineering wasn't her only talent. Some say she graduated by sheer force of will. Her first assignment out of the Academy was, oddly enough with Starfleet Security. Her assignment was to devise new safeguards and countermeasures against unauthorized parties trying to gain access to secure data. During her 6 year tenure on Earth, she discovered that Orion Syndicate knew where she was. While she didn't think that the syndicate would be foolhardy enough to attempt to gain access to one of the most heavily guarded facilities in the quadrant, she decided that for her own safety, and the safety of those around her she would be better served to put in a request to transfer to a Starship. February 12, 23xx: Cadet was reprimanded for showing up frequently late to class, not having assignments completed on time. and being argumentative with instructors. October 4: 23xx - Note from Admiral Daniels: While Cadet O'Hara has well documented issues with discipline, in all my years in the service, I don't think I've ever met a more gifted and natural Engineer. May 28, 23xx - Graduated from Starfleet Academy, Promoted to Ensign. September 7, 23xx - Reprimand from Cmdr Jameson: Ensign O'Hara showed up 45 minutes late to her duty shift, stinking of whiskey, complaining of a headache. In spite of her best efforts to convince me otherwise, I believe she was hung over. Her Birthday was last night, and I heard stories of her dancing on the bar at the Launching Pad. January 10, 23xx -Commendation from Admiral Walker: Ensign O'Hara was singlehandedly responsible for repelling a cyber-attack on Starfleet Central Database by members of the Orion Syndicate. She has been awarded the Meritorious Service Award for her efforts. June, 30, 23xx - Reprimand from Cmdr Jameson: Lt O'Hara reported for duty drunk this morning. When confronted about it, she went on a tirade about how the Syndicate knew she stopped their attack and were coming for her, so it didn't really matter. The Lieutenant was ordered to counselling sessions. July 28, 23xx - Reprimand from Cmdr Jameson: O'Hara's behavior is becoming increasingly erratic, and Counselor Morgan has reported that she is not attending counselling sessions. September 6, 23xx - Reprimand from Cmdr Jameson: O'Hara failed to report for her assigned duty shift today and removed her combadge so she could not be located. She was eventually found at a bar in Dublin, Ireland claiming that she had an approved request for a personal day. I never authorized any such request, however there is one logged and authorized. I suspect she used her computer skills to log and authorize it herself, though I am not currently able to prove otherwise. January 31, 23xx - Commendation from Admiral Beam: Lt JG O'Hara has finished the data encryption and countermeasure project a full year ahead of Schedule. The best minds in the Federation have, as of yet, been unable to crack her encryption protocols. They have been scheduled to roll out fleet-wide at the beginning of next year. August 3, 23xx - Having completed her project at Starfleet Security, Lt O'Hara has requested a transfer to active Starhship duty. She awaits reassignment.